Join the sport of cheer ! PAFA Spirit is a feeder program for our local high schools. 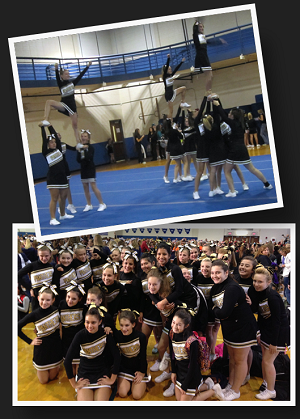 We offer athletes in grades 3-8 two opportunities to cheer with us! Athletes may participate on a Cheer team where they cheer for the Palatine Amateur Football Associations football program and cheer at games during their season or athletes may participate on a cheer team that supports the Palatine Amateur Football Associations football program in September and then attends local competitions* in Ocotober and/or November! Our season begins July 22. in the evenings. Competition teams will practice 4 nights during week 1, 3 nights during weeks 2 & 3 and then 2 nights once school starts. They will cheer for the PAFA Football teams during the month of September at Home games. Additional practices will be scheduled on Saturday or Sunday in September and October for older teams and October for younger teams in preparation of competition season. There will also be a choreography camp in August. Athletes that cheer at football games only will practice 3 nights a week beginning July 22, then 2 nights a week for weeks 2 & 3 and then 1 night a week once school starts. They will cheer each weekend, either Home or Away on Saturday or Sunday, during the PAFA football regular season (Aug-Oct) and then will cheer during the Playoffs and Championship games in November. 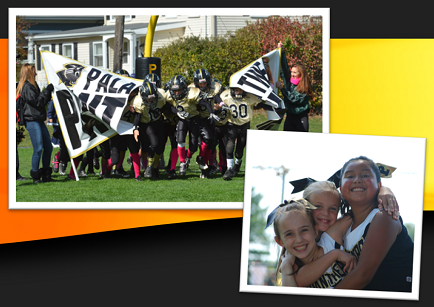 PAFA Cheer is for athletes in grades 3-8. The sport of cheerleading includes sideline cheers, stunting, halftime routines and competition routines in preparation for junior high and high school cheer. Competition details will be provided in July. State Competition fees are additional. PAFA Flags is not currently offered by PAFA Spirit. If you are interested in starting a Flags Corp, please contact the PAFA Spirit President. When offered, PAFA Flags is for athletes in grades 6-8. There are weekly practices during the season and game day performances in preparation for high school flags. PAFA Poms is not currently offered by PAFA Spirit. If you are interested in coordinating a Poms program, please contact the PAFA Spirit President. When offered, Poms is for girls in grades 6-8. The sport of poms focuses on competition routines in preparation of junior high and high school poms. Tumbling is an important part of cheerleading and dance is an important part of poms. PAFA strongly encourages our participants to enroll in tumbling and dance classes and clinics if they wish to continue in High School Cheerleading or Poms at a varsity or competition level. PAFA does not include tumbling or dance lessons as part of the program, however tumbling is incorporated into routines for those girls with tumbling experience. Our coaches are not certified gymnastics/tumbling coaches and thus, to ensure safety, they do not spot or instruct on tumbling techniques. There are a number of fantastic cheer tumbling programs throughout the Palatine area. With the exception of our high school coaches, we are an all-volunteer organization and we always need the help of our participant families. If you are interested in volunteering please contact the PAFA Spirit President. Congratulations to all our competing squads! 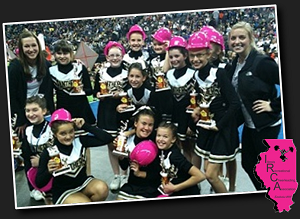 Learn More About PAFA Competitive Squads!